Limited Supply! This impressive plant is rare and we're thrilled to offer them to you this season. Cardiocrinum is undoubtably the most impressive plant from the Himalayan region. The stems are incredibly tall and sturdy, the leaves are large, and heart shaped, often having a metallic sheen when they first emerge. 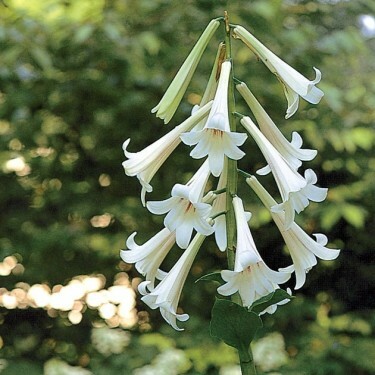 The flowers are large, often measuring 15- 18 cm long, a pure white colour with purplish throats that smell sweet and vanilla-like! 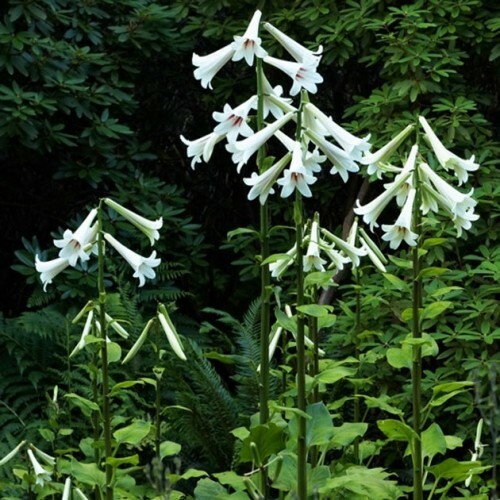 Cardiocrinum prefers soil that is deep, fertile, humusy, organically rich and moist throughout the growing season but well drained. Mix your existing soil with plenty of leaf mold, compost and sand or crumbled bark or gravel. They will not tolerate standing water, they will rot. Plant so that 1/4 of the bulb is above ground, firmly tamp it down, then cover the tip loosely with leaf mold or aged compost. This will help protect the tip from slugs, rodents or late frosts. Mulch in winter with several inches of rotted leaves or other mulch, to help disguise and protect the bulbs as well as providing nutrients over time to the bulb and offsets. It’s a nutrient-demanding plant so adding aged manure in the spring will pay off as the season progresses. Cardiocrimun is considered to be monocarpic, which means the bulb dies after it flowers but the good news is that when it’s planted in surroundings that are like home, they will produce offsets and seeds. You can leave them alone and the offsets will grow, but smaller. To have the big spectacular stalks and flowers you will need to gently separate them and plant them separately. To divide the offsets from the spent bulb it’s best done in late winter/early spring. Cut off the old stalks, gently use a pitchfork to lift the clump and remove the various different sized offsets. They can be planted back into the ground, with the tips just below the surface, far enough apart that you do not need to move them again because they don’t like to be disturbed. You can plant some of them in containers. Depending on the size of them they can take 3-5 years or more to flower. 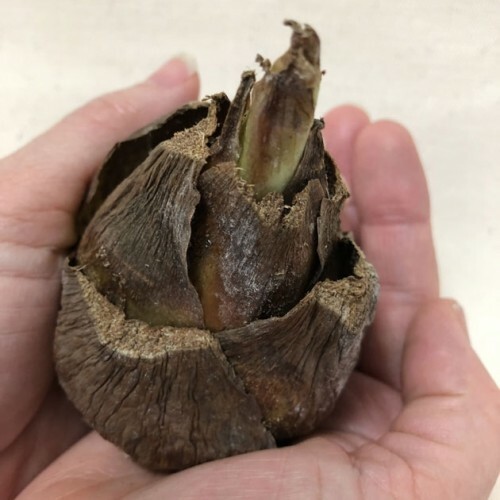 During all the various different stages of this bulb’s life you can work in organic bulb food, fish bone meal and compost to feed and nourish and encourage flowering. Although it requires considerable effort to grow this plant well they are soooo worth the effort!